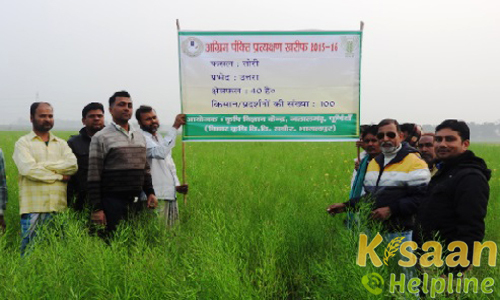 Preview- Krishi Vigyan Kendra, Jalalgarh,Purnea was established in Feb 2004 at the premises of Regional Research Sub- Station, Jalalgarh(Purnea) vide ICAR Sanction order No. 1984, 21/100/84 dated 14th March 1984. From its starting period till 4th August 2010 it was under administrative control of Rajendra Agricultural University, Bihar, Pusa (Samastipur). With the formation of Bihar Agricultural University, Sabour (Bhagalpur) presently it is under administrative control of Bihar Agricultural University, Sabour (Bhagalpur) from 5th August 2010. As per mandate of Indian Council of Agricultural Research, New Delhi, the centre is dedicated for providing technical support to the farmers of the district through conducting on farm trials for assessing, refining and documenting agricultural technologies, Front line demonstrations with improved technologies and by providing training facilities to farmers, rural youth and extension functionaries working in field of agriculture and allied sectors. The District is situated in Middle Gangetic Plain of North East Alluvial Zone of the Country within Latitude 25°57’17.3” N and Longitude 87°32’13.1” E having geographical area of 3202.30 sq.km. Ecologically the district comes under Eastern plain with hot sub-humid (moist) Eco-region with hot-wet summer and cool-dry winter with an average annual rainfall of 1305 mm and mean annual potential evapo-transpiration (PET) demand of 1300 mm. Soil, having sandy to loam and sandy in texture, is suitable for cultivation of maize, vegetables, fruit orchards etc. In context of horticulture, the soil is favorable for growing mango, litchi, guava, banana and bamboos.